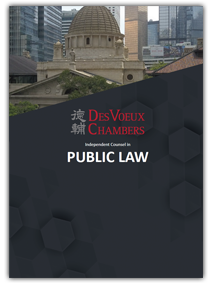 This area of the law principally involves legal challenges to decisions of public bodies and continues to develop at a rapid pace given that the Hong Kong SAR has its own written constitution, the Basic Law. DVC houses an ex-Attorney General, an ex-Solicitor General and prominent members of the former Attorney General’s Chambers, and many members have been involved in leading administrative and public law cases, such as the Link REIT litigation and a recent appeal to the Court of Final Appeal involving important questions of state immunity. Members are also regularly involved in commercial judicial reviews, including acting for the Hong Kong Stock Exchange, and in various public inquiries. This Silk is esteemed for being “an excellent strategist and a most effective advocate who knows how to package a case and what points to push.” A favoured choice in judicial review cases, he is also sought after for technology related and competition disputes. One of our members is credited for "being obviously very sought after" and for "coming up with extremely persuasive arguments that no one else could think of." Another is singled out for being a "very forceful advocate" who "will fight to the utmost for clients," and is admired for an ability to "take on difficult cases and turn them into winners."